The Seattle giant has started selling print books in Brazil and is raising the bar in the Brazilian book market. When facing the daily frustrations of mind-numbing bureaucracy, poor service and lack of infrastructure, it is common for Brazilians to say they live in one of Dante’s rings of hell. In Rio de Janiero, some people even use the expression “Hell de Janeiro” when disappointed with the city. These typical frustrations, encountered in daily life and when doing business in Brazil, have made local publishers and booksellers very skeptical about Amazon’s success in Brazil. Even before the company launched its Kindle operation in December 2012, the talk of the town was that Jeff Bezos’ guys would never be able to function optimally in a country with poor logistics, overcomplicated taxes, omnipresent bureaucracy and lack of extensive delivery services other that the government-owned post office. “They are going to face the same kind of problems we have always had,” said Sergio Herz, CEO of Livraria Cultura, to Reuters in June 2012. “Until now, they were in heaven and we were in hell. Come to hell with us, Amazon,” the executive at one of Brazil’s top bookstore chains joked. Well, despite all the difficulties, Amazon has finally arrived in hell — and in style. On August 21, around 4 a.m., on the eve of the opening of the São Paulo International Book Fair, Amazon started selling print books in Brazil. It was not such a big surprise: after all, the market has been expecting this ever since the company started shipping Kindle devices and accessories in February. Of course, there were challenges that delayed the launch, including difficulty acquiring good book metadata and struggles to guarantee the high-level of service from Brazilian partners that Amazon demands from its vendors. And don’t forget the World Cup, which all but shutdown the country for a month. With a six-month wait, skepticism grew that Amazon would launch physical book distribution at all. Local publishers told themselves the company was moving too slow; some even speculated that it might leave Brazil altogether. Amazon is offering 50,000 print titles in a marketplace with scarce metadata. That was merely wishful thinking. The fact is that Brazilian Amazonians were putting in practice the first part of Jeff Bezos’ motto: “Work hard, have fun, make history.” It was hard work compiling a catalogue of 150,000 Portuguese print titles in a book marketplace with scarce metadata. And while it is extremely difficult to accurately estimate the exact number of Brazilian books in print, it is unquestionable that Amazon’s print coverage is surprising and substantial. “We are launching the store with the largest Portuguese books catalogue in Brazil, and you know we are obsessed with offering a very good catalogue, one that not only features best-sellers but also long-sellers and backlist titles,” said Alex Szapiro, Amazon’s Country Manager in Brazil. 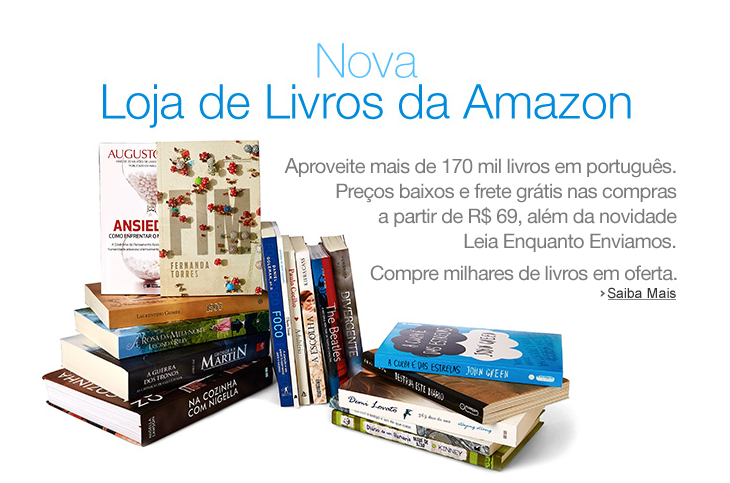 Aside from offering an extensive catalogue of titles for purchase and delivery, Amazon is giving free shipping for purchases over R$69 (US$30) and — something new — a “Read While Your Book Ships” feature that is available for 13,000 titles, allowing Brazilian customers to digitally read the beginning of the books they have bought while waiting for the package to arrive. For fulfillment and warehousing, Amazon has outsourced its logistics to Luft, a local company, which is working under — and will no doubt improve (or fail dramatically) —under Amazon’s supervision. Amazon itself still has lots to improve in Brazil if it is to live up to its own pronouncements of being a “customer-centric” company. First, the Americans needs to accept other forms of payment than credit cards. Numerous Brazilian consumers prefer to pay for online purchases with debit cards or even with the accursed “boleto,” a barcode-based payment system that allows consumers to pay for online transactions at their banks. Also, the practice of selling items so they can be purchased several installments, even with a credit card, is widespread in Brazil. Amazon, however, does not currently allow customers to pay in smaller, monthly installments. Competitor Livraria Cultura, for instance, accepts payments in up to ten installments. Amazon, therefore, should accept a broader selection of payment forms as well as installment payments if it wants to be de facto customer-centric. The most important thing that Amazon is offering to Brazilian customers is a 30-day return policy, where Brazilian law only requires 7 days. “This shows our thinking: if someone calls in 20 days to say he wants to return a book, we will accept it,” explains Szapiro. This might be mean nothing in customer-centric marketplaces such as the US and the UK, but the truth is that average Brazilian customer service is as good as the Brazilian national rugby team, the “Tupis.” Have you not heard about them? Well, lots of Brazilian have not heard about a good customer service experience either. Therefore, the simple fact that Amazon is offering an extended period for the customer to rethink a purchase is a real innovation and gives hope that the Seattle giant may try to raise the bar on how customers are treated in Brazil. Customer service is not the only aspect of retailing where Amazon may have a voice of influence. Things are changing for better in logistics and metadata, since vendors are already adapting to Amazon’s demands. Publishers and book distributors have had several orders returned over the last few weeks due to product quality issues. (Alas, Amazon has made mistakes as well and Luft has returned goods that were acceptable.) But vendors have also improved their shipping process and have even invested in equipment to recover books and deliver them as Amazon demands. When it comes to metadata, at least one leading Brazilian publisher had to review and generate cover images of over a thousand titles in order to be included in Amazon’s catalogue. If Amazon holds to its detailed demands from the vendors, the quality of logistics and metadata will rise in the Brazilian book market. One thing on which Amazon has not been very demanding or aggressive is the discount negotiation for acquiring books from publishers. Reports from the market suggest that the company accepted discounts of 40 to 45% off the cover price, while local competitors like Saraiva enjoy discounts close or equal to 50% even when negotiating with the big publishers. From medium and small-size publishing houses, the big Brazilian retailers enjoy discounts as high as 55%. This might explain why Amazon had no resistance from publishers and distributors when looking to pull their books into the Amazon catalog. Only time will tell, however, how long the friendly discount rates will last. It is ironic that in the same month that Amazon decides to go physical in Brazil, its main local rival, Livraria Saraiva, has plunged deeply into digital led by its tech-savvy CEO Michel Levy. On August 5th, Brazil’s largest bookstore chain not only launched its branded dedicated e-reader, the LEV, but also a full digital strategy for the company. Since then, the 114 Saraiva stores are being used to promote the LEV and its digital platform, and the whole company, including the publishing division, seems focused and excited about succeeding in digital waters. Meanwhile, Kobo is struggling to grow in Brazil, despite its partnership with Livraria Cultura. Google and Apple, in turn, although still relevant, are just passively benefiting from the huge number of iOS and Android devices in the country, without any significant developments. Both stores still demand that Brazilians pay in US dollars, with an international credit card, while collecting a 6.38% foreign currency purchase tax. Today, Saraiva and Amazon together control between 55% and 60% of the Brazilian digital market. Considering Saraiva’s new digital posture and the digital traction Amazon will get from leveraging customers from its new print book sales channel, it is not hard to imagine the year closing with Amazon and Saraiva being numbers 1 and 2 respectively in the Brazilian digital market, with a combined market share close to 80%. Now it is time to wait and see if the third part of Jeff Bezos’s motto, “Make history,” will happen in Brazil. Hopefully, Saraiva and other local competitors will grow in efficiency and stop Amazon from developing a harmful monopolistic attitude. But even if this is the case, Amazon will have made history anyway by raising the efficiency bar in the Brazilian book market, making it a more heavenly place. And one can only hope the competition follow along – or it will be hell. Carlo Carrenho is a Brazilian publishing consultant and journalist. In 2001, he founded PublishNews, a daily electronic newsletter in Portuguese that covers the Brazilian publishing market. He’s also worked for several Brazilian publishing houses, including Thomas Nelson Brasil, which he launched in 2007.